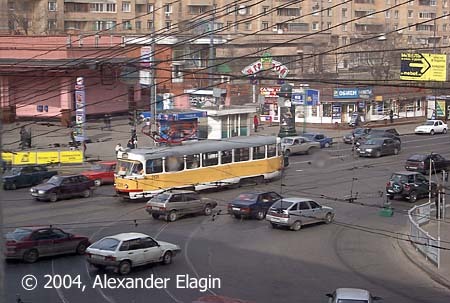 Krasnoprudnaya Street is a part of a radial road that leads from Komsomolskaya Square to the north-east. The road is a part of an ancient way from the heart of the city to Sokolniki forest, a favourite recreational district for more than two centuries. Krasnoprudnaya Street got the first tracks in 1875. 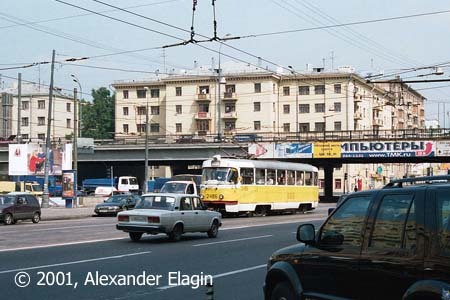 A few decades later, the first line of Moscow metro system was built right under the street; but, strangely enough, the tram line has been surviving a parallel work with the underground (and trolleybus routes, too!) and continues its service up to date. 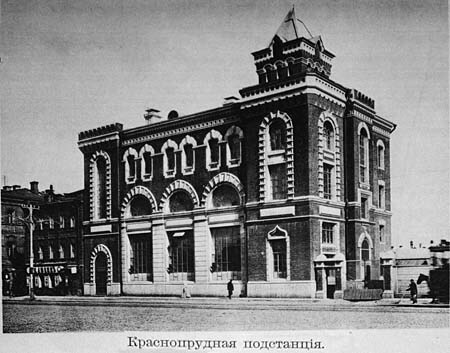 This nice building of the Krasnoprudnaya electric substation was constructed in 1904. This substation was the second one built for the tram. It has been operating since that time until now; of course, the mechanical current rectifiers had been replaced with ignitrons, and they in turn - with solid-state diodes. A century ago the substation looked the same, but the neighbourhood has completely changed. Photo from Vadim Rosaliev's collection. 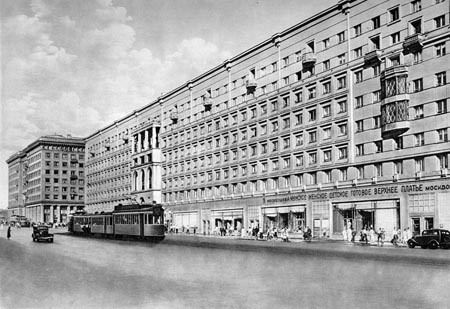 A view of Krasnoprudnaya Street from late 1930s. 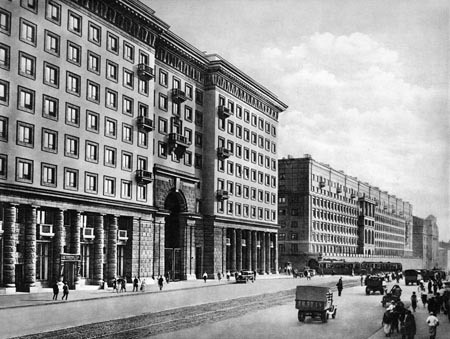 Those monumental building were erected as the first stage of Kirovskiy Prospekt avenue. The project of this avenue was cancelled by the war with Nazis and was never implemented as initially planned - the style of the post-war buildings is totally different. The view from this point is almost the same as today - just the trams (currently routes 7, 37 and 50) are modern, and the number of motorcars is two orders of magnitude higher than on this photo. Photo from Boris Fedorov's collection. An arc-shaped pavilion of Krasnoselskaya metro station is located at a crossing of Krasnoprudnaya Street with Krasnoselskaya Street. 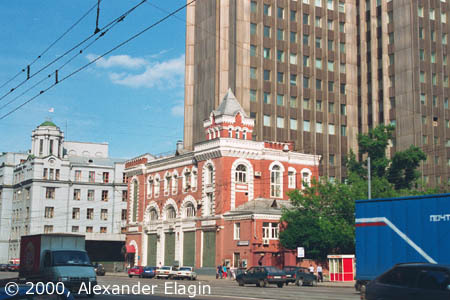 A tram line to Baumanskaya Street and further to Lefortovo branches here from the main line. 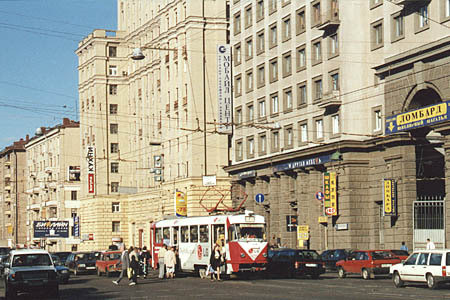 Krasnoselskaya Metro stop is located in the centre of the street, and motorcars have to stop and wait to let the passengers board the tram. This span of the street after the junction is operated by routes 7 and 45. Another photo from the late 1930s shows the tracks right there where they are placed today. The view from this point also has not changed much, only the rightmost building on this photo has been replaced with a tall tower in 1970s. Krasnoprudnaya Street ends at a crossing with Gavrikova Street, but the latter has been almost completely consumed by a highway overpass in early 1980s. Having crossed the overpass, the road changes its name to Rusakova Street.